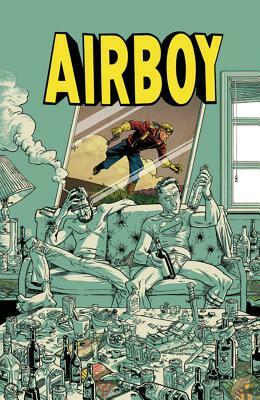 When acclaimed comics author JAMES ROBINSON (Starman, Fantastic Four) is hired to write a reboot of the 1940s action hero Airboy, he's reluctant to do yet another Golden Age reboot. Just what the hell has happened to his career-? His marriage? His life? Hey, it's nothing that a drink can't fix. It's after one such night of debauchery with artist GREG HINKLE that the project really comes into its own. Quite literally. Because Airboy himself appears to set the two depraved comic book creators on the straight and narrow. But no one in this story has their life go according to plan. Read the entire series in one hardcover collected volume, which features a brand new story dealing with the reaction to the comic's initial publication that doesn't turn out the way anyone expects...least of all Robinson and Hinkle. A satirical look into the comic book industry paired with the debauchery of Hunter S. Thompson's Fear and Loathing in Las Vegas.